Cristiano Ronaldo wants his former team-mate, Marcelo, to follow in his footsteps and make the switch from Real Madrid to Juventus. Ronaldo completed a shock £100million transfer to the Serie A earlier this summer, but Juventus could further bolster their ranks with the signing of the Brazilian full-back. Marcelo and Ronaldo have linked up on the left-wing for Real Madrid for the past nine years, and now the Portuguese star wants to bring that partnership to Italy, according to Tuttosport. 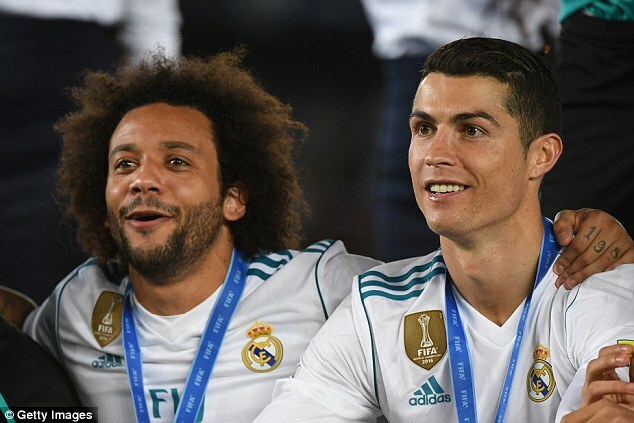 The Italian sports news outlet claim that Marcelo is considering a move to follow his friend and former Real Madrid team-mate, Ronaldo, to Turin. Both have won it all in Spain, as well as four Champions League trophies and the Brazilian could also be tempted by a new challenge. It would round off a turbulent summer at the Bernabeu after the departures of Zinedine Zidane and Cristiano Ronaldo, despite having won their third successive Champions League title. However, Juventus would only be interested in bringing the Brazilian in if they lose Alex Sandro, who is wanted by Paris Saint-Germain. Tuttosport claim it would take an offer of over £36million to sway Juventus into selling Sandro. 0 Response to "See What Cristiano Ronaldo Is Planning To Do To Former Real Madrid Teammate.. Messi Will Be Happy About This"